Use your logo to reflect the intended qualities of your business. A thick and heavy typeface can convey strength and power whereas a fine and light typeface will convey elegance and austerity, for example. If you wish to use a symbol to convey your business to the public, be sure that it is relevant, can be readily reproduced and is not overly complicated with colours or filters. 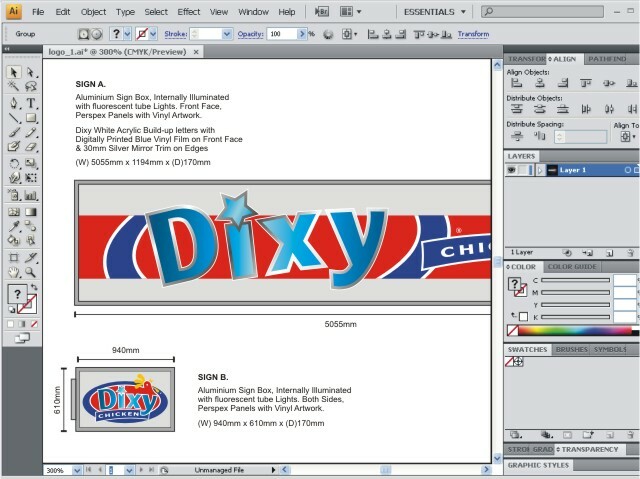 Save your logo in PDF, EPS, WMF or another vector based format rather than JPG or bitmap based formats to ensure the logo can be scaled to any size without compromising its quality. You may have full artwork for your proposed signage, in which case we are able to bring your creations to life. We'll work closely with you using our state of the art design softwares to develop your initial ideas and provide on-going proofs until you are happy with the result. Of course, if you do not have any ideas at all, we'll come up with some from scratch and present them to you. To achieve well designed and effective signage, these three questions should always be considered. Does the sign clearly identify who you are? Does the sign clearly identify what you do? Does the sign clearly identify how to contact you? Any other additional information should appear secondary with less impact and avoid cluttering the core message.